The award winning British furniture designers and manufacturers, Knightsbridge Furniture, have recently unveiled the first two pieces of the new Elan Collection. Designed by Jason Lansdale exclusively for Knightsbridge Furniture, the new collection comprises of a 2 seater settee and armchair. 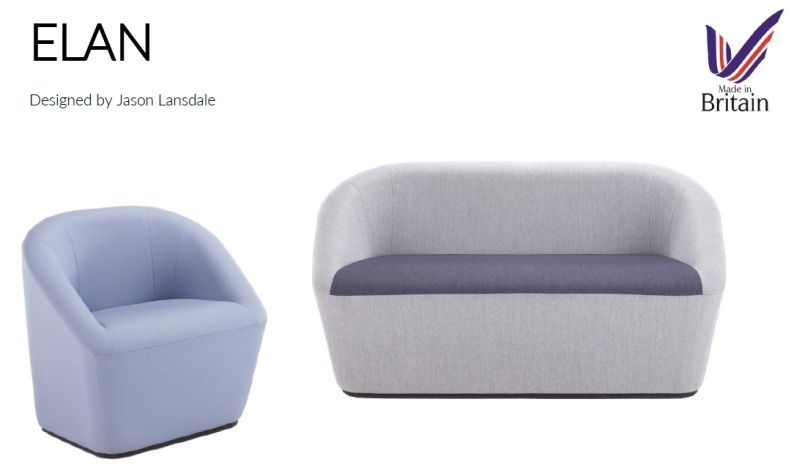 Jason Lansdale is a furniture designer who specialises in the design and development of upholstered furniture, seating, system furniture and furniture related product designs. Since establishing his own design studio in 2008, Jason Lansdale has collaborated with national and international clients, in a variety of sectors across the furniture industry. Designed as a one piece sealed unit ideal for mental health and healthcare sectors, Elan has been constructed using non-retractable security screws with no visible staples, crafted carefully with comfort and practicality in mind. The carpet base, fitted as standard, will ensure damage to vinyl flooring is prevented. Elan is a versatile range that would fit perfectly in bedrooms, receptions and lounges or breakout areas and features a 10-year frame guarantee. To request more information on the Elan range or the Knightsbridge challenging environments collection contact our sales department on 01274 731900, email sales@knightsbridge-furniture.co.uk or visit www.knightsbridge-furniture.co.uk .